As part of our ongoing drive to provide a one-stop-shop lifting and rigging offering, we have partnered with Toll Group, one of Australia’s leading supply base operators. Redspear Safety and Toll Group operate a 65 Ton Holding Capacity spooling machine capable of spooling 25M/Minute and powered by a 72Kw diesel powered HPU. This unique machine is fully adjustable and is capable of maintaining constant tension between 2 Ton – 10 Ton. The design of the machine is suitable for lifting on and off vessels or held quayside with additional counterweight capable of line and constant tension spooling operations. As part of the service, we offer empty drums for wire removal and have onsite facilities for winding off unwanted scrap wire directly into waste. 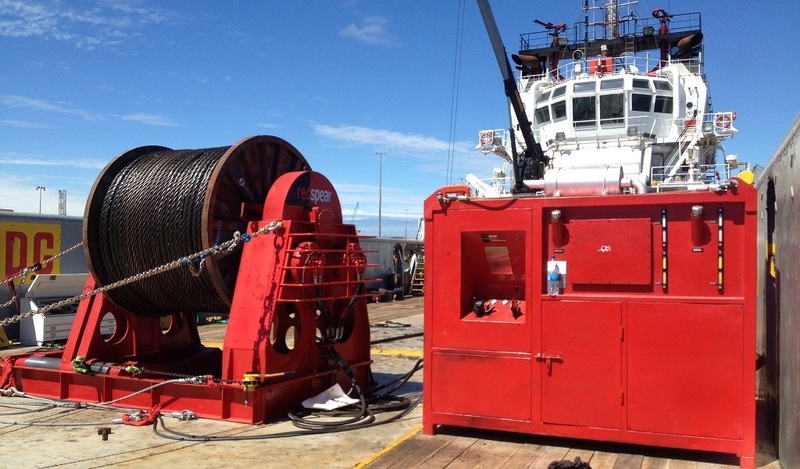 This service coupled with Redspear Safety’s unique international buying capability leads the market in integrated marine wire spooling service and wire rope supply. One of the innovative additions to our service offering has been the introduction of portable wire rope testing by way of magnetic inductive sensing technology and Magnetic Flux Leakage (MFL). Reduction in maintenance downtime resulting in greater efficiency and cost reduction. There has also been a substantial increase in accuracy given the advanced sensor technology given that the equipment is able to detect defects with high repeatability. Redspear Safety is able to perform this inspection service on a broad range of wire ropes with diameters ranging from 0mm to 130mm. Redspear Safety offers a comprehensive suite of inspection services covering all lifting and rigging equipment, working at heights equipment, fabricated equipment, offshore equipment and height safety installed systems. Inspections are conducted by our qualified inspectors who provide reports detailing current status of all equipment. Visual inspections of wire rope slings, chain slings, webbing and round slings and spreader bars can be performed as required. Inspection and subsequent testing is performed in accordance with relevant Australian and international standards, with test facilities of up to 600T available. Furthermore, we also offer a broad suite of non–destructive testing including: Magnetic Particle Inspection (MPI), Liquid Penetrant Inspection (LPI) and Ultrasonic Testing (UT). In addition to our exceptional product sales and services offering, we have launched our new equipment hire solution to assist our clients with short and long-term equipment requirements. We provide high quality lifting and rigging gear and mobile fall arrest structures all of which are fully maintained to original manufacturer standards. An added benefit is that our equipment is inspected and cleaned prior to delivery so it’s ready for immediate use. We are also able to provide NATA testing prior to despatch of product should this be a requirement. It should be noted that this service will incur an additional fee.